Comedy stories are thin on the ground, so we felt it was only right to provide our beloved readership with a good laugh on this Friday morning. First up is the curious tale of the Norfolk Clown Epidemic. Norfolk police apparently felt that it was a sensible use of their time to warn the public to ignore people dressed as clowns. With reports flooding in from Northampton of people left scarred by their run-ins with the marauding suspects, the police feel that reacting to the clowns would only encourage them. Superintendent Carl Edwards managed to keep a straight face when he assured citizens that officers would patrol the areas where they had been sighted, and if they found any clowns, they would "offer them strong words of advice". He did however "like to stress that it isn't against the law to dress up as a clown." Reports that Boris Johnson has been spending more time in Norfolk of late are as yet unconfirmed. 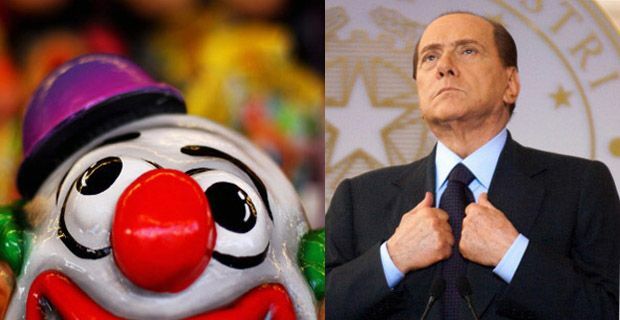 This local chuckle / grave public threat however paled in comparison with the news that Silvio Berlusconi’s 28 year old girlfriend has requested an audience with Pope Francis to clear the newly expelled senator’s name. Proving her comedy skills just as adept as those of Il Bunga Bunga himself, she described his extraordinarily tardy removal from politics as a ‘coup d’etat’. Exactly what she thinks the Pope could do to ‘clear his name’ is a mystery, though perhaps her assumption of the elasticity of authority is derived from her ill treated beau. And then of course is the question of why a Pope who is desperately trying to rehabilitate the public image of Catholicism would touch Silvio with a 10 foot disinfected communion wafer. But bless her, she’s very passionate / deluded. When asked about the litany of offences he is accused / convicted of she said " I know that that would not be him; he would not recognise himself in the mirror in the morning – and even I wouldn't recognise him." But then Botox can be deceptive.